Rim Village Condo Vacation Rentals have a shared pool and hot tub. 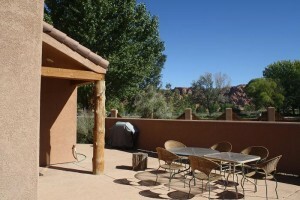 The units have large 2 car garages, extra parking, and patios with excellent views of the Moab Rim and La Sal Mountains. Inside you will be pleasantly surprised how much room there is. Combination living room/dining room with vaulted ceilings, large master bedroom with private bathroom, separate laundry room, all on a single level layout. 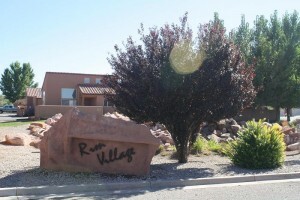 Rim Village is probably the most complete and comfortable condo complex in the Moab area and is an excellent choice that will surely satisfy all your vacationing needs. Rose Garden Trail Vacation Rental Condo is a well decorated 3 bedroom 2 bath home located at the southeast corner of the Rim Village complex. From the front patio you get one of the best unobstructed views of the second highest mountain range in Utah, the La Sal Mountains. It is equipped for up to 8 people. King bed in the master, Queen in the second, and 2 twins in the third bedroom. Sofa Sleeper in the living room. No Pets, no smoking.